Rusk County Amateur Radio Club: The Reverse Beacon What?! If you've never heard of the Reverse Beacon Network, then set aside some time on Saturday, February 1st. The Worldwide Radio Operators Foundation is hosting a webinar highlighting the network and showing how to use it to make more contacts! Click here to register. So what is the the Reverse Beacon Network? 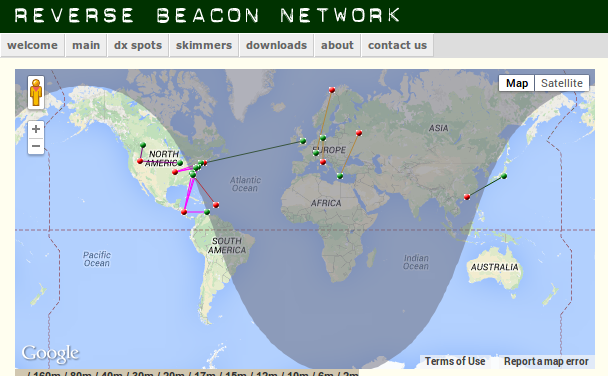 According to its website, the Reverse Beacon Network is a revolutionary new idea. Instead of beacons actively transmitting signals, the RBN is a network of stations listening to the bands and reporting what stations they hear, when and how well. So what is the big deal? Well, to begin with, you can see band openings in near-real time on an animated map. You can call a quick CQ, and see which reverse beacons hear you, and how strong you are. But the real breakthrough is in the database of past "spots". You can instantly find out what stations, from a given country or zone, have been heard, at what times and on what frequencies. You can see when you've been spotted, who spotted you, and how loud you were.